Billy Rae Carole came to The Primavera Foundation seeking supplies for his dog Lucy, a mixed lab breed with bright green eyes. The friendly, extraverted dog loves being fed tasty treats. The Primavera Foundation partnered with Friends of PACC during the summer months for the Pup in Boots Go Kits project, providing people experiencing homelessness with supplies for their pets. Carole, who’s participating in the project, had only good things to say. Each kit contains information on where to get pets spayed and neutered, treats and a gallon of dry dog food. Along with the care bags, people and their pets are also given harnesses, bowls, collars, leashes and dog booties when available. n August, Bennett Simonsen, an Animal Protection Supervisor for PACC, said that since the beginning of the summer, Friends of PACC had given out nearly 300 pairs of dog booties to people experiencing homelessness for their beloved companions. 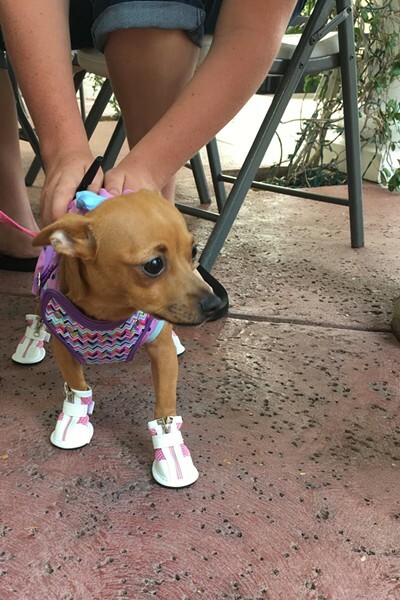 The dog booties come in all sizes for large and small pets. Many of these booties were given out to protect the paws of pets when walking on the hot asphalt in the summer heat. Simonsen said this initiative helps people experiencing homelessness take care of an animal they love. He says Friends of PACC can’t always provide everything they need but are there to give some help and options. 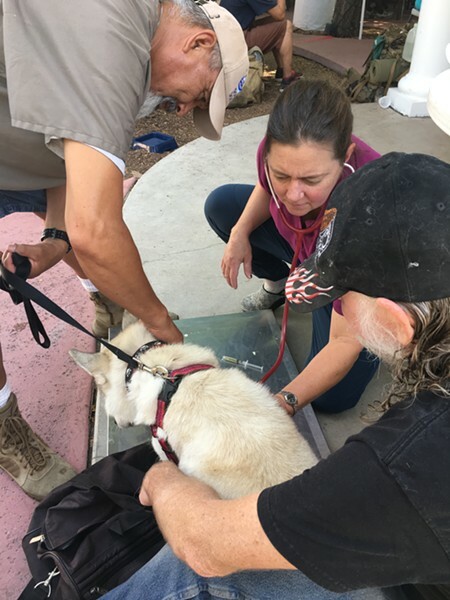 Serving in an outreach project, Simonsen said the biggest factor in helping those in need is trust, which is built when people come to them for assistance with their pets. Simonsen said that by helping the animal with their needs, it also helps the person experiencing homelessness as well. However, resources can sometimes be scarce. Sylvia Adkins, a PACC Field Officer for nearly 10 years, has been contributing to the cause by going to parks and assisting the homeless pets. She does occasional nail clipping, microchipping and handing out food when she can. She said it’s great for people experiencing homelessness to have pets because she has noticed that sometimes they take better care of their dogs than themselves. 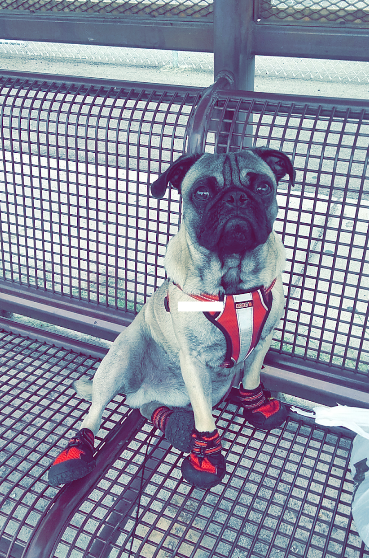 Biggz the pug in his new booties. Clarissa Aleman and her pug dog Biggz try to visit Primavera every Wednesday to receive supplies. Biggz waddled around with a constant grin, so excited to meet everyone around him. Aleman said the project helped her during tough times. She said Friends of PACC had given her plenty of dog food, treats and dog booties. She particularly liked the booties and expandable dog bowl, which she uses to make sure Biggz never goes thirsty in the Arizona heat. Program Manager at the Primavera Foundation, Emma Hockenberg, believes that no matter what a person’s housing status may be, they should be treated with integrity and respect. She said that Primavera mainly serves people and hadn’t catered to animals until now. “Having a judgment free place where people can ask questions and receive care for their animals is really important for people living on the streets,” Hockenberg said. Nikki Reck, Communication Specialist for Pima County, has also dedicated her time to help this initiative. She agrees that the pets and people are in good hands. “If the pets are loved and doing well, it’s better than being in a kennel waiting for someone to adopt them,” she said. Reck hopes that more of the Tucson community can help volunteer with Friends of PACC or donate to the new cause. For more information on Pup in Boots Go Kits project and how to get involved go to friendsofpacc.org/projects/pupinboots.